The dams on the Columbia-Snake River system aren't going away anytime soon. With government-funded projects on the horizon - including repairs to locks scheduled for this winter - and a number already completed, Kristin Meira argued Wednesday that the government is putting in decades-long investments into the dams. Meira, executive director of the Pacific Northwest Waterways Association, addressed a crowd of more than 60 community members at a luncheon Wednesday at Clarkston's Quality Inn. She discussed projects on the river system and addressed criticism of the four lower Snake River dams. The latest batch of criticism of the dams, Meira said, ties the Snake River dams to the fate of orcas that live in Puget Sound. "Those orca populations are steadily trending upward, as we see more fish being provided out of the river system out into the ocean for the orcas to eat," she said. She said the survival rate of juvenile fish traversing the dams has reached 97 percent, and adult fish returning to spawn have a dam passage rate of nearly 100 percent. 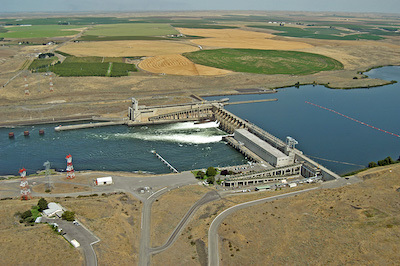 Some groups have also lumped the Snake River dams in with the Elwha and Glines Canyon dams on the Elwha River, and the Condit Dam on the White Salmon River in Washington, Meira said. Those three dams, all of which have been removed, had no fish passage, no navigation and no flood control benefits. "It is in no way fair to have a comparison of these projects with the Snake River dams, which are considered state of the art," she said. Another point of contention, Meira said, has been dredging projects in which the U.S. Army Corps of Engineers scoops or suctions up sand that builds up in navigation channels. Dredging projects locally have mostly been confined to the confluence of the Clearwater and Snake rivers, she said, and are "very small" projects. She also brought up a January 2015 ruling by a U.S. District Court judge in Seattle that allowed dredging to continue last winter. That ruling was upheld in February when the same judge said the corps violated no environmental laws and was not required to complete a cost-benefit analysis. It was a "historic" ruling that people will refer to for years to come, Meira said. "It was a very strong endorsement of the navigation, the need to do maintenance dredging once in a while, and what the corps does," she said. "We are extremely pleased." More support is coming for the Columbia-Snake River system in mid-December, Meira said, when four dams and locks are set to undergo repairs. The Little Goose Dam, second closest to Lewiston, is one of the four included in the project. "This is good news," Meira said. "This means that this administration and this Congress and the last few congresses have said, 'What does it take to make sure that these locks are in tip-top shape?' "
The inland river system will be taken offline for 14 weeks for the repairs. Meira said that length of time is needed because some of the locks are in places that are difficult to access. "It takes a lot to make sure that they're in good working order out here," she said. The corps of engineers last closed the river system in 2010, when three locks got new gates and three more underwent major repairs. Projects like the repairs ensure the "long-term viability" of the river system, Meira said. "These components that they're putting in, they have design lives of 30 to 50 years," she said. "No one is making plans for those locks or those dams to go away."